Learn how Credits and Debits will impact your transactions. In double entry bookkeeping, debits and credits (abbreviated Dr and Cr, respectively) are entries made in account ledgers to record changes in value resulting from business transactions. 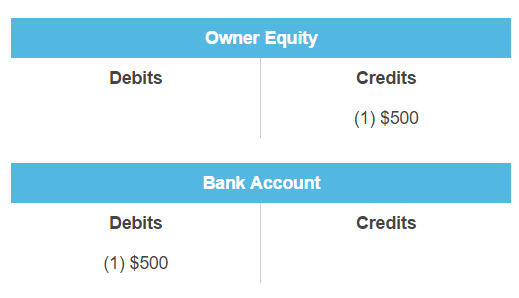 An account ledger looks a T (which is why it can be called a T-account) with debits on the left and credits on the right. Generally speaking, the source account for the transaction is credited (that is, an entry is made on the right side of the account's ledger) and the destination account is debited (that is, an entry is made on the left side). Total debits must equal total credits for each transaction; individual transactions may require multiple debit and credit entries to record. Here's a simple example. Let's pretend you're the owner of a business and you put in $500 of your own money as an investment into your business. The money is coming from you, the owner, so the Owner Equity account is the source account. This means we need to make an entry on the right side, the credits side. And the money is going into the Bank Account, which is the destination. So we also make an entry on the left side, the debits side. This journal entry is made up of the Owner Equity account being credited $500 and the Bank Account being debited by $500. Debits and credits match making this a valid journal entry. Now with money in your bank account, let's do another example. Let's say you bought $100 worth of office supplies using money from your bank account. The money came from the bank account, so it's the source account and we make an entry on the right side (credits). 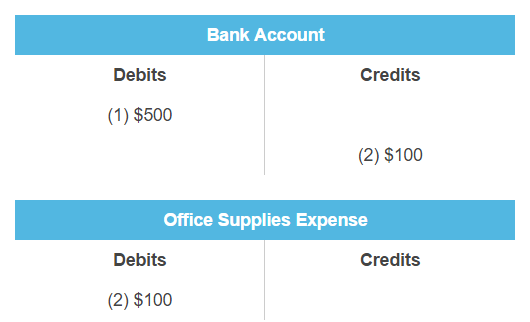 The destination account is Office Supplies Expense, so we make an entry on the left side (debits). Note: The transactions making up the 2nd journal entry are labeled (2). This 2nd journal entry is made up of the Office Supplies Expense account being debited $100 and the Bank Account being credited by $100. So again, debits and credits match making this a valid entry. Individual transactions may require multiple debit and credit entries to record. Here's an example of a journal entry that has more than two debit and credit entries. In this example, let's say you use your bank account to pay back a bank loan (so you have to pay $150 for the principal and $50 for the interest). The source account will be the Bank Account, so you'll use the right side and make a credit entry of $200. The twist on this example is that there are two destination accounts. 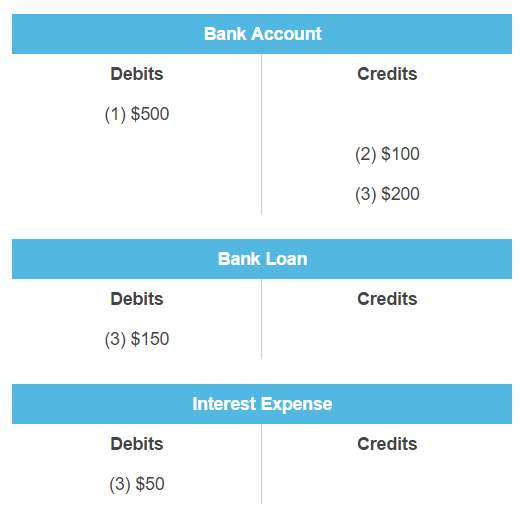 One is the Bank Loan account which will get debited $150 and the second is the Interest Expense account which will get debited $50. This 3rd journal entry has credits of $200 and debits of $200 ($150 + $50). 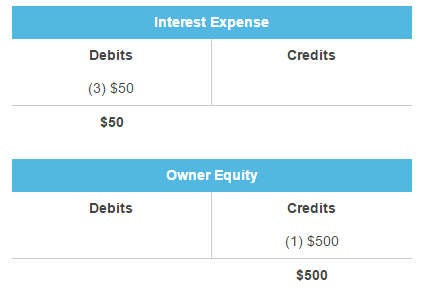 So, you can can have multiple debits and credits in an entry, as long as at the end debits = credits. 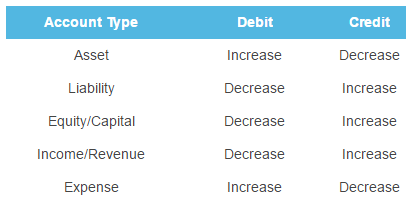 Using our example transactions above, our trial balance would be made up of the following transactions. As you can see, certain accounts have more debits than credits and others have more credits than debits. The Bank Account, Bank Loan account, Interest Expense account, and Office Supplies Expense account have Debit balances while the Owner Equity account has a Credit balance. And if you add up everything, you'll find that there are $500 in debits and $500 in credits. They equal each other as they should, since debits always needs to equal credits. Accountants use this trial balance to prepare financial statements (such as the balance sheet and income statement) which communicate information about the company's financial activities in a generally accepted standardized format. When recording numbers in accounting, a debit value is placed on the left side of a ledger for a debited account and a credit value is placed on the right side of a ledger for a credited account. 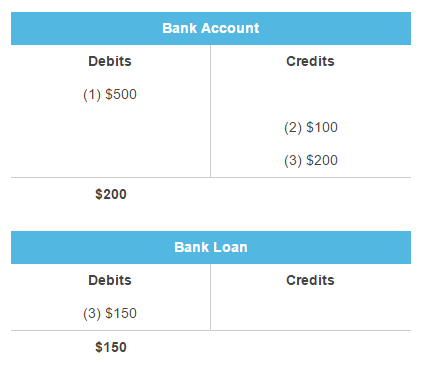 A debit or a credit either increases or decreases the total balance in each account, depending on the type of account. 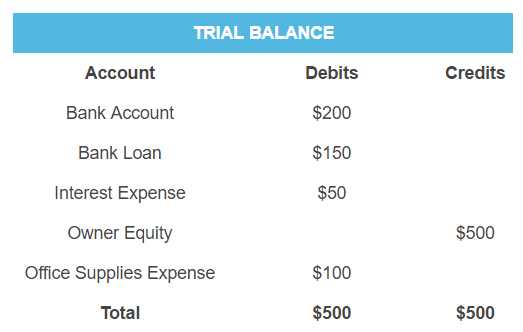 Our example trial balance shows that the bank account has a debit balance of $200, which means there is positive $200 in the account since a debit balance is the normal state of the bank account. If the bank account had a credit balance, this would mean that there is negative $200 in the account (like when an account is in overdraft). The reason why individuals see debits and credits in the above manner, is that the bank statement presented by the bank to the customer is the bank's view of the account. The bank views money in a checking account as money the bank owes to the customer, i.e. a liability, and in the rules of accounting, an increase to a liability account is a credit. Likewise, when a bank lends money to a customer and places the money into the customer's checking account, the bank has increased its obligation to pay that money, which is a liability, and this increase is a credit and appears in the credit column of a bank statement. 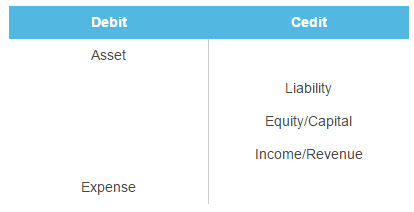 In Kashoo, you can use debits and credits on the Transfers page or the Adjustments page. Please view the articles below to learn how.